Cloth diapers are back! We have been using cloth diapers for almost two years now, and they have been wonderful. If you haven’t seen cloth diapers recently, these are not your momma’s cloth diapers. You know, the prefold squares that need crazy origami skillz while the baby is kicking and pins that you need to fasten the diaper closed with(while trying not to stab a leg). New cloth diapers in the last several years look a lot like disposable diapers (but cuter) and are washable. Some come with liners that you can flush if you do not want to handle the mess, but they are really easy to manage and usually stink free. While prefolds and plastic pants are still used because they are economical and simple, there are other options for parents on the go who do not think they have time for cloth diapers. Enter the pocket diaper. There are so many brands, so many styles, so many deliciously cute prints, and so many choices such as snaps or velcro. For more information on cloth diapering, head to the Zany Zebra website. I started out with pocket diapers because I didn’t know a thing about cloth diapering and fell in love. Basically, it is a pocket that you stuff with inserts to make it more absorbent. When it becomes used, you throw it in the diaper pail until wash time. No need to soak the diapers or mess with stinky solutions or bleach. Just put them in the wash, do a pre-rinse, wash, and extra rinse. Line dry or tumble dry. Who knew it was cool to like poopy diapers? In fact, I recently sold many of my diapers that have been used for two years and they kept half their value! What else can you poop in, wash, and drag through the mud for one and a half years and resell for $$? You definitely can’t do that with disposables and I hate the way disposable diapers feel in my hand, on my baby, and in the trash. Modern cloth diapers range in prices from $ to $$$. If you are diapering on a budget, it does take a small up front investment, but DEFINITELY recoups its value in just a few months, if that. For us, we bought $$ diapers, so it took us about 5 months to recoup the value, and we used them for 2 years. We were going to use them on baby #2, but decided on some other styles so sold the diapers and used that money to buy the new diapers, plus money left over. 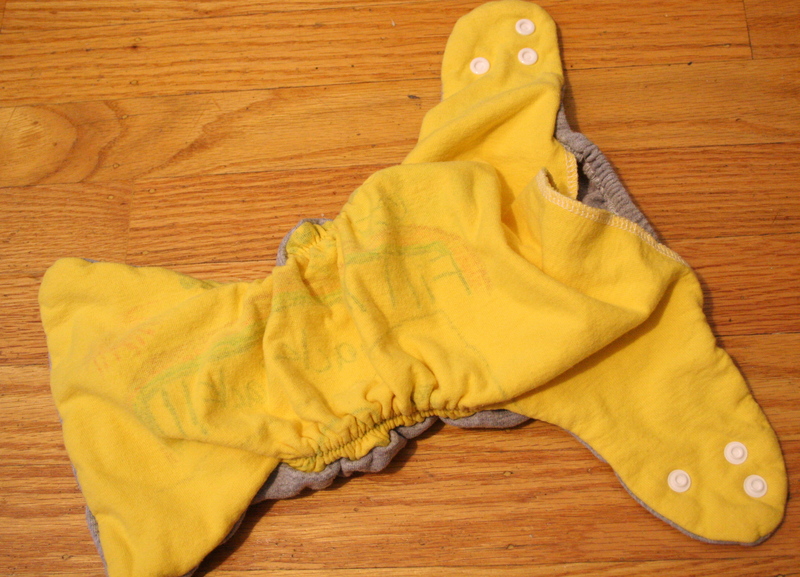 So this post is about SUPER budget diapers, and making diapers out of T-Shirts!! It is my new favorite craft! Don’t you just love the cute “I love Mom” bum in the picture? That’s my boy. On him is a small t-shirt diaper(all in one) that took about 2 hours to make and doesn’t need snaps- you could still use pins or velcro. All you need is some t-shirts, some elastic(or not), and your sewing machine. 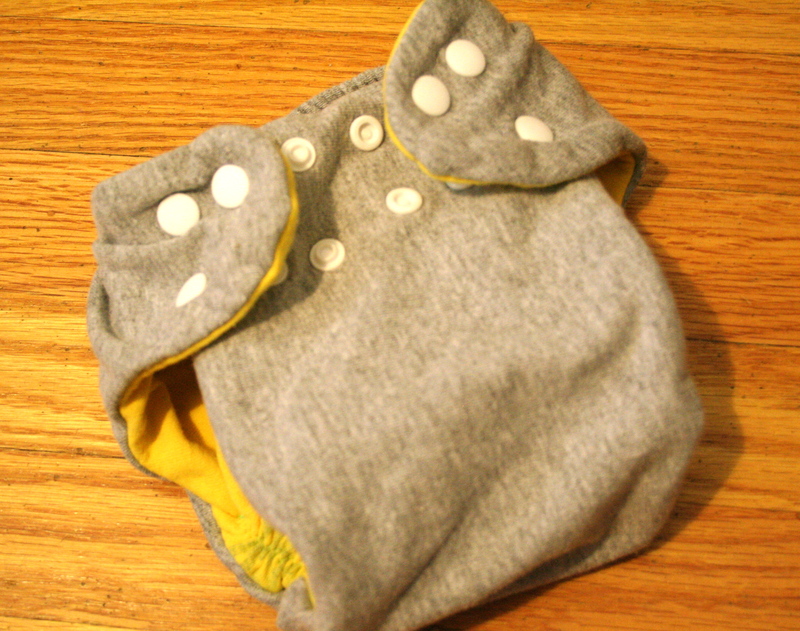 A great resource for a t-shirt diaper tutorial is Fern and Faerie. The Fern and Faerie website has tutorials for sewing fitted diapers as well as square prefold diapers. My favorite resource for patterns and information is Zany Zebra. Zany Zebra has oodles of resources including information on cloth diapering, links to cloth diaper patterns, etc. For my diapers, I made a small and a medium out of 2 t-shirts. By using 2 shirts, I was able to fit two patterns on one shirt as well as get contrasting colors. I am all about making the most of my fabric even if it is “free”. I made my own pattern on a piece of paper bag and traced it onto the t-shirt with a washable marker. For the small, the “soaker” is sewn right into the diaper(all in one) and the medium is a pocket diaper where you stuff the “soaker” into the pocket. While I did not take pictures of the whole process, I basically sewed two cuts together to form the outside of the diaper, sewed two cuts together to form the inside of the diaper, and then sewed the front and back together to make a pocket. 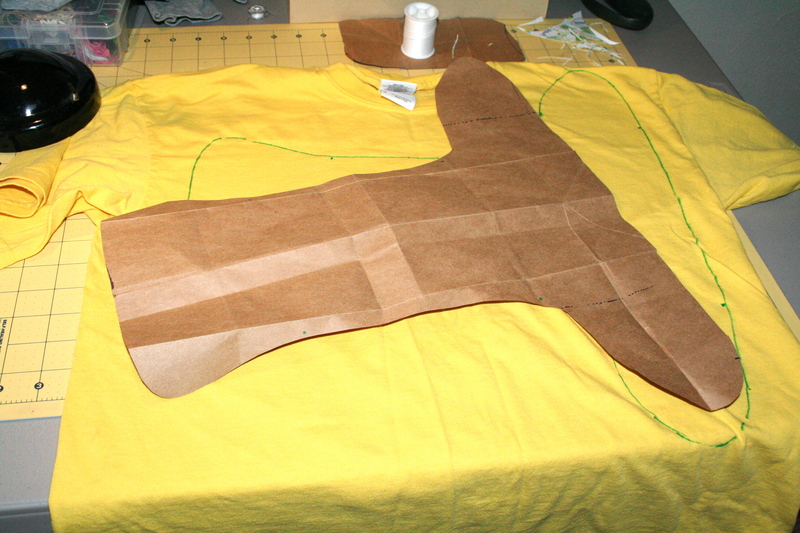 See the Cloth Diaper Sewing website for info on drafting your own pattern! You can get fancy by adding accessories like leg elastic, back elastic, and snaps or velcro for a closure. My diapers have leg elastic that I’ve had in a box for years as well as snaps because I have a snap press. You will need to stuff the diaper to make it more absorbent. Since t-shirts are cotton, they are less likely to cause diaper rash, but stay WET so you need to change them more often. I made inserts out of the t-shirt scraps left over and terry cloth(towel). You will also need to cover them with a waterproof diaper cover unless you are enjoying fun in the sun! I love my t-shirt diapers so much, I want to share one with a reader! All you have to do is write a comment on any NEW post from now until June 1(including this one). On June 1 (in honor of my mother in law’s birthday), I will randomly select a winner to receive either a small(6-12 lbs) or medium(10-20 lbs) cloth t-shirt diaper like the ones pictured above! I’ll contact you by email address as well as announce the winner on June 1. Can be sent to US addresses only. Post edited to include: Cloth diaper giveaway can be sent to US addresses only.